Cottonwood Crossing is GRAND OPENING! Model show home is complete. Wynne/Jackson introduces Cottonwood Crossing, an enclave of 48 patio homesites nestled into a convenient location within minutes to HWY 75. The lots were designed for Normandy Homes. Normandy Homes is made up of an award winning team of seasoned professionals with many years of home building experience committed to provide innovative architectural design, high quality craftsmanship and energy saving construction all in the best locations. 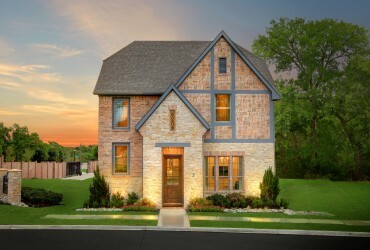 This new community is near all that the thriving city of Allen has to offer, including shopping, dining, and entertainment. Allen, TX has been ranked one of the 10 Best Towns for Families to live in 2013 and “less crowding, concrete and stress; more serenity, nature and neighbors you can count on,” by Family Circle. In addition, D Magazine has recognized Allen for the Top 10 Dallas Suburbs, based on: safety, graduation rate, population rate, ambiance score, and median age. The city is a warm and inviting place for all to enjoy from its fun night life to its beautiful parks and recreation program. The City of Allen is also known for its premier shopping destinations, such as Allen Premium Outlets, an award-winning golf course, The Course at Watters Creek, nearly 200 restaurants, and its very own 7,000-seat arena Allen Event Center. Normandy Homes is actively selling one and two story patio homes that are selling from the low $300’s to the low $400’s.